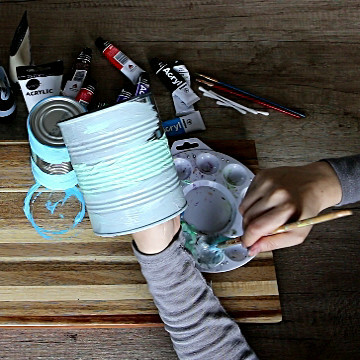 Crafts with cans are a gold mine for a variety of DIY home decor projects. 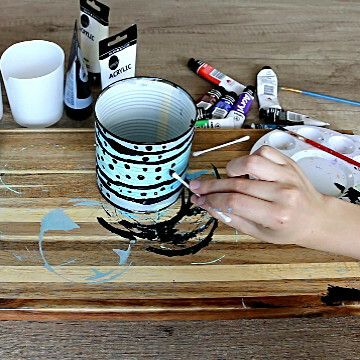 This short DIY will walk you through 2 fun and easy to make tin can decor ideas. 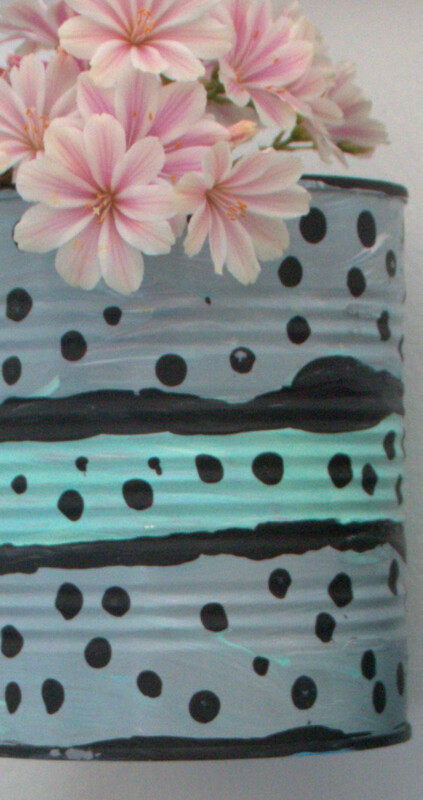 We will be making a tin can utensil holder and tin can flower vases. Now you have a fun excuse to go through your pantry and set aside a few cans for a DIY makeover! For this home decor DIY project with tin cans you will need 4 tin cans, a few sharp nails, a hammer, a few Q tips, and a couple of plastic containers (e.g., from yogurt). Cut the plastic containers at about 4″ of height – we will use these for the tin can flower vases. To save some time down the road, clean the cans, fill them with water, and leave them in the freezer overnight. This will make it easier to make holes in the cans. 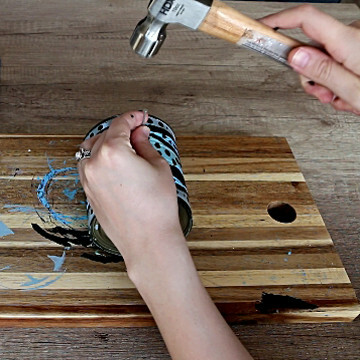 I, unfortunately, skipped this step but was still able to make these crafts with cans work, so not to worry if you don’t have the patience to freeze the tin cans. 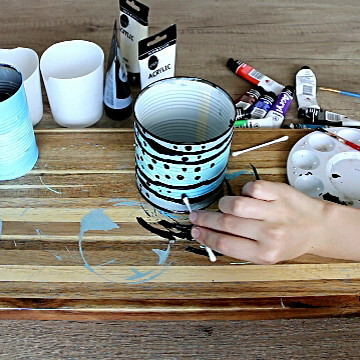 Start by coloring the cans with acrylic paint. 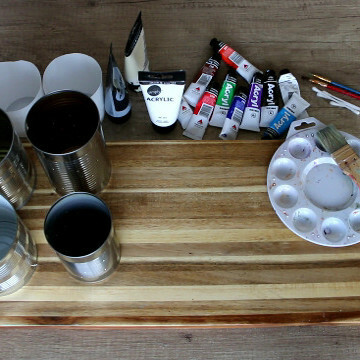 Acrylic paint will work great, as long as the cans are not exposed to rain, snow, etc. Below you can find materials similar to those I used to paint the tin cans. Once the tin cans are painted, let them dry. 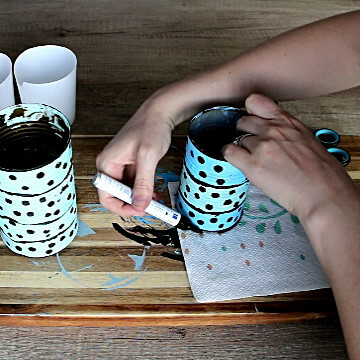 Then, use black paint to outline the different shades of color and shapes on the cans. Take a Q tip and dip it in black paint. 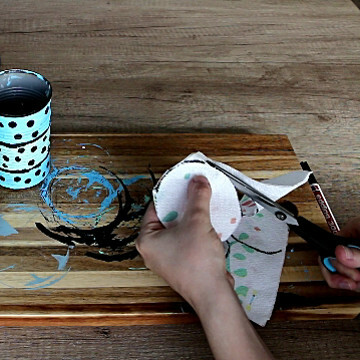 Use the Q tip to paint black polka dots on the tin cans. Use a nail and a hammer to make a wide hole at about 2/3 the height of the cans. If you have frozen the cans, make the hole before painting. If you don’t have a wide nail, you can make a few smaller holes and connect them to make a wider hole. Cut two circles from a napkin and place them in the other two cans. The two cans lined with napkins will be our DIY tin can utensil holders. 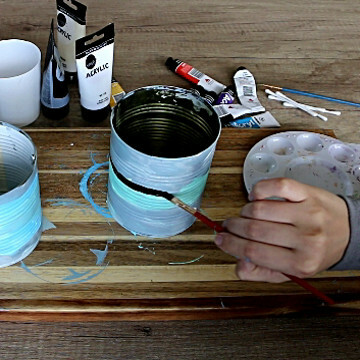 Finally, place the two plastic containers in the tin cans to make a couple of DIY tin can flower vases. 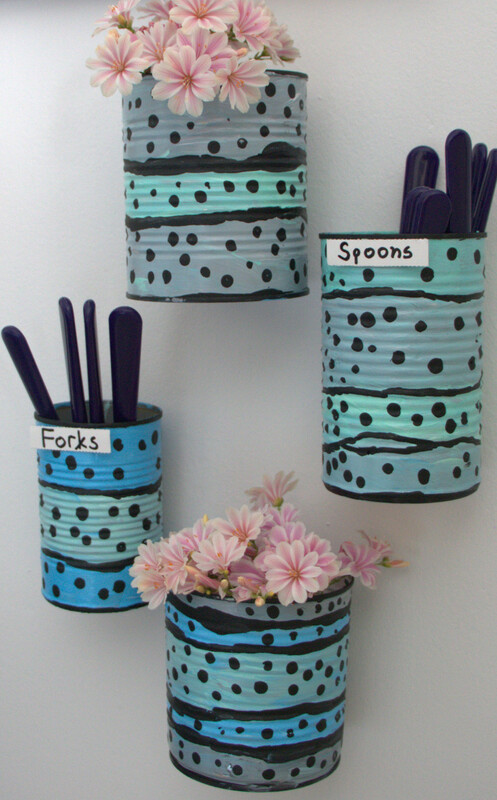 Hang the tin can utensil holders and the tin can flower vases using the holes in the cans. 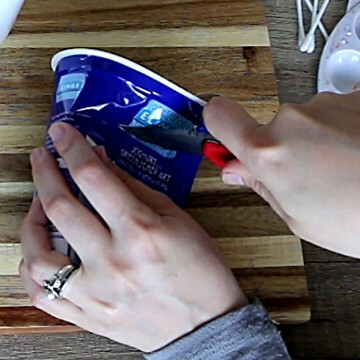 You can also make paper labels for the tin can utensil holders and glue them to the cans. 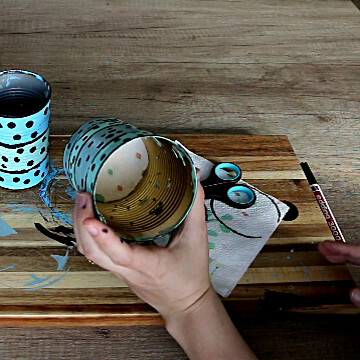 Below you can see the final results of these two ideas for crafts with cans.